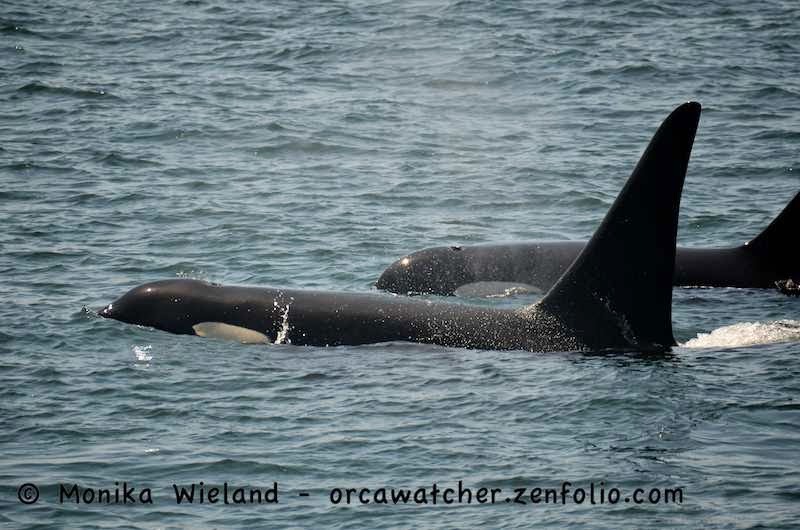 Late in the morning on June 3rd all kinds of rumors were flying around about whales on the west side: J-Pod, transients, L-Pod! It sounded like whales were everywhere. I just had to get out there and see what was going on so I went out to go investigate. 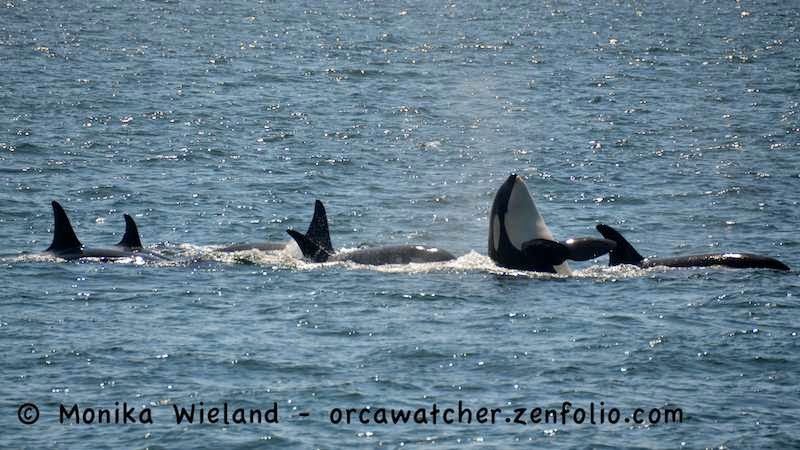 I met up with three fellow whale watchers at Land Bank, and we weren't sitting there too long before the first whales started rounding the point to the south of us. In the lead, not surprisingly, what J2 Granny. 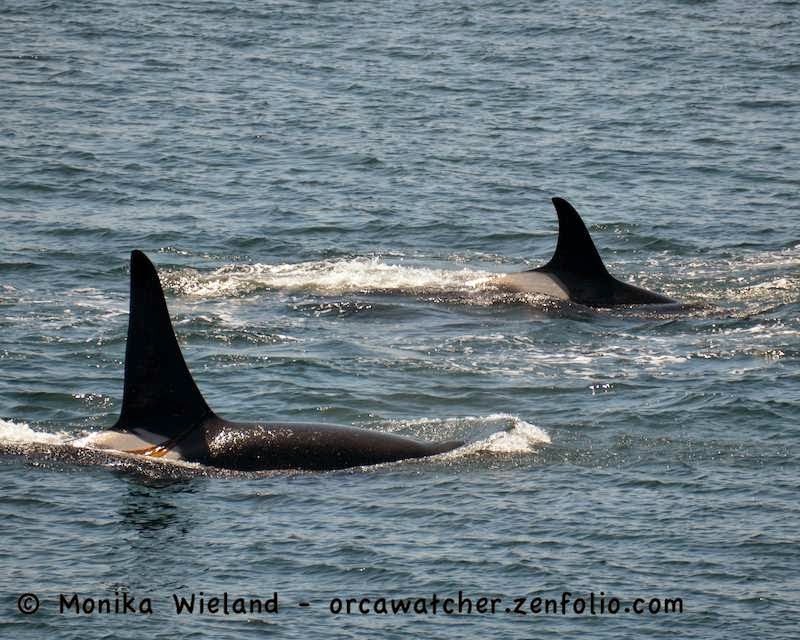 With her was J19 Shachi, J41 Eclipse, and J26 Mike. The four of them passed us and started angling in towards shore. 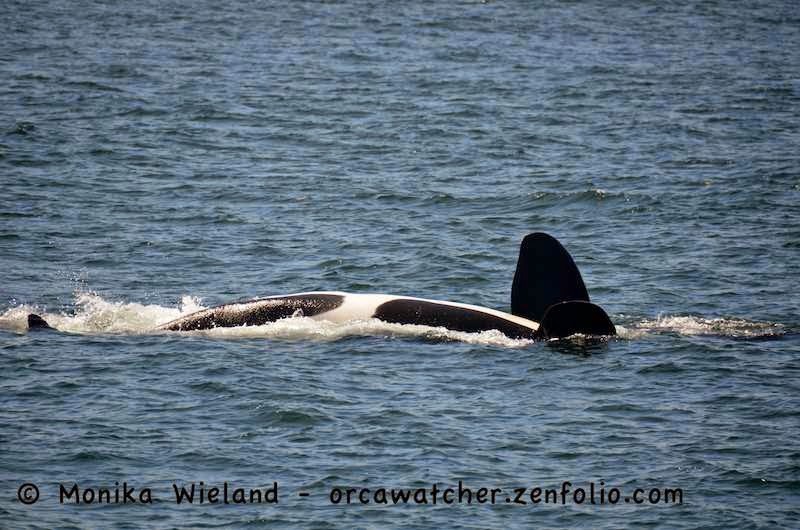 I could see more whales coming from the south, but felt like I needed to get to Lime Kiln. The "whale chase" was on! 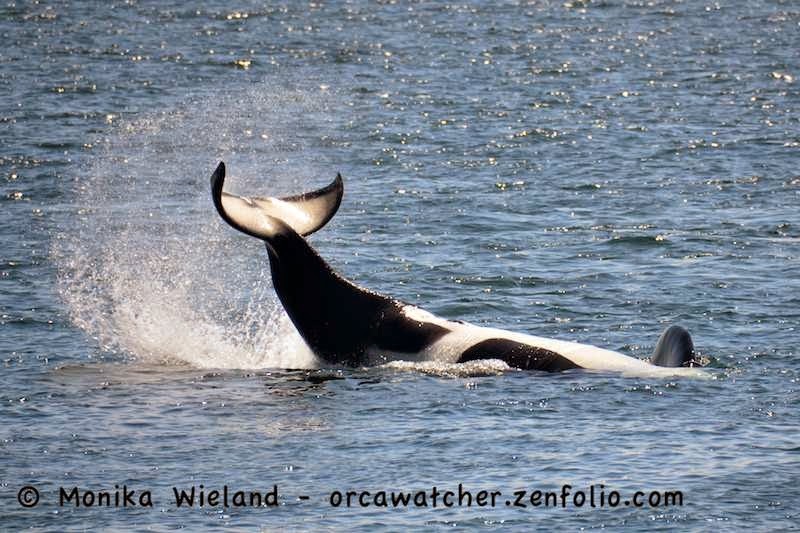 I jetted over to Lime Kiln and got there about the same time as the whales. They were a bit closer to shore, but stalled out, and sure enough, soon turned and headed back south. Frustratingly, I could see blows to the south, right along the shoreline at Land Bank where I had just been! 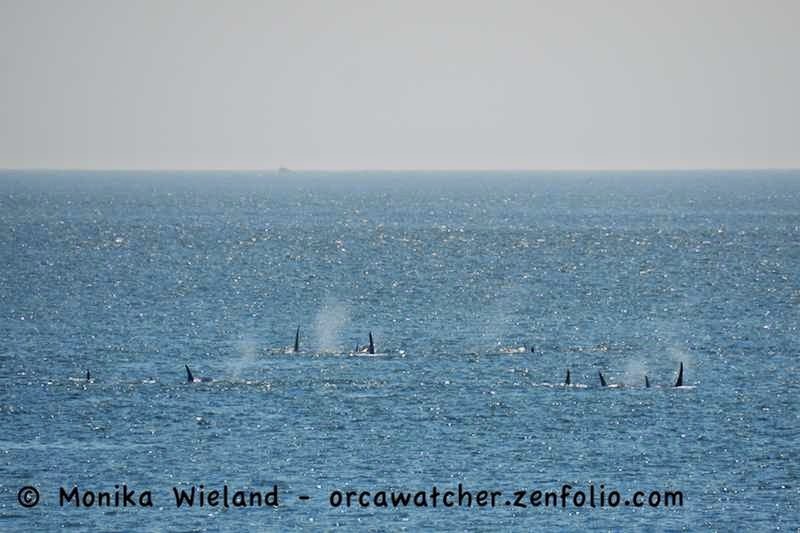 I waited a little longer, but all the whales eventually turned around and headed south, out of sight. Feeling like I should get back to put in a little more time at work, I decided to leave and take one last look from Hannah Heights before heading back to town. When I got to Hannah Heights, however, I saw several boats very close to shore and heading back north! 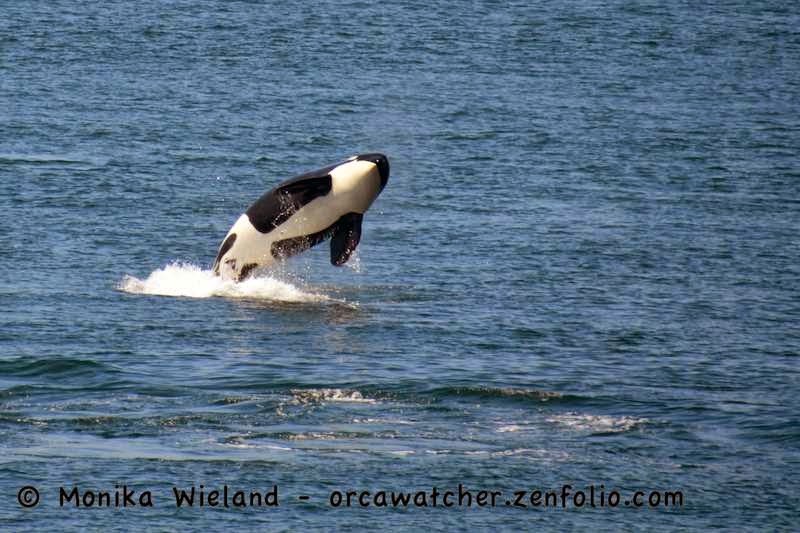 I didn't even wait to see a whale before reversing my course and high-tailing it back to Land Bank again. 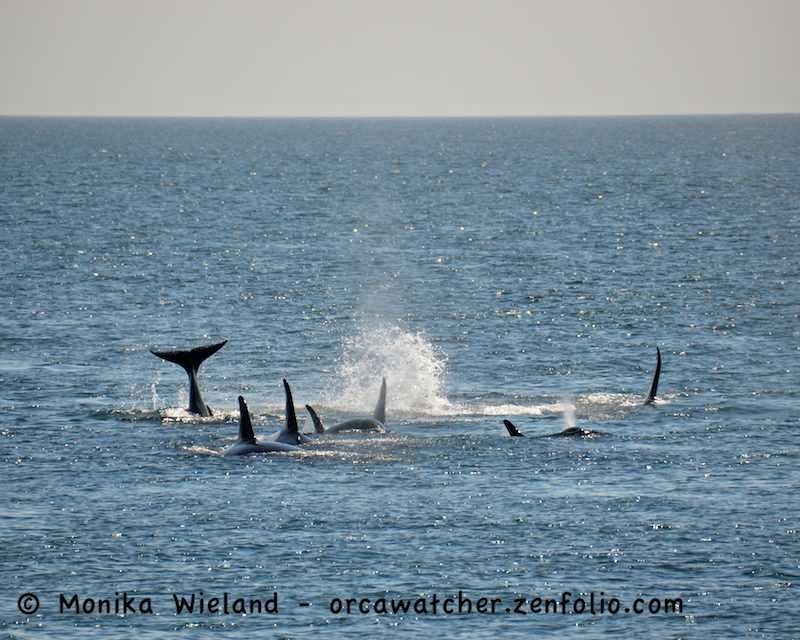 I got there just in time to watch the whales slowly approach in two large, tight groups. 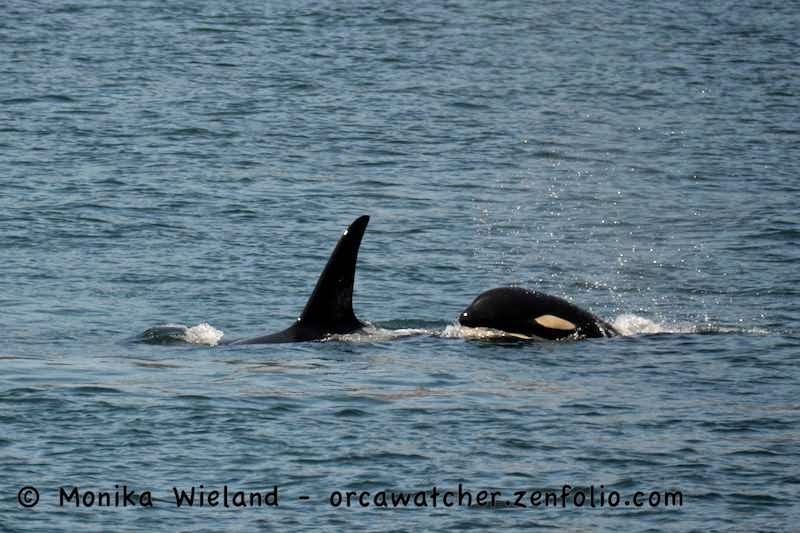 There were clearly more whales than the 15 or so members of J-Pod that had been hanging around for the previous three days, but who else had shown up? 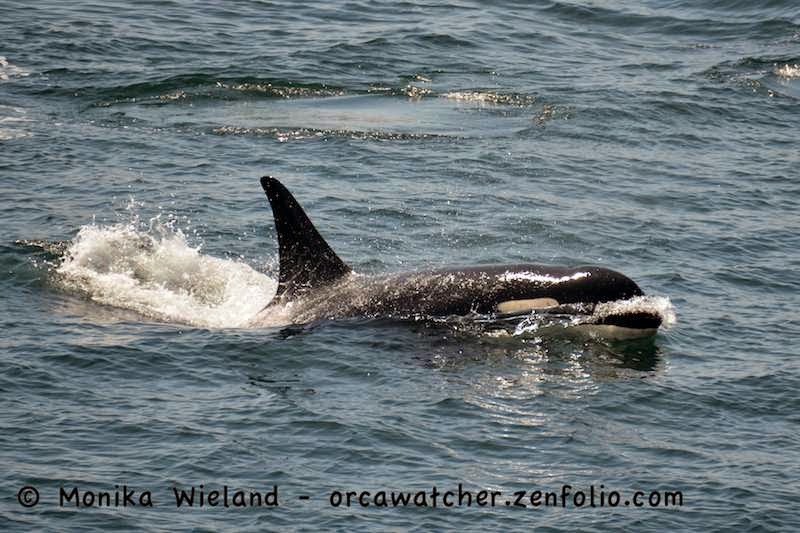 My first clue was when J27 surfaced, and I think I exclaimed outloud, "Blackberry!!" 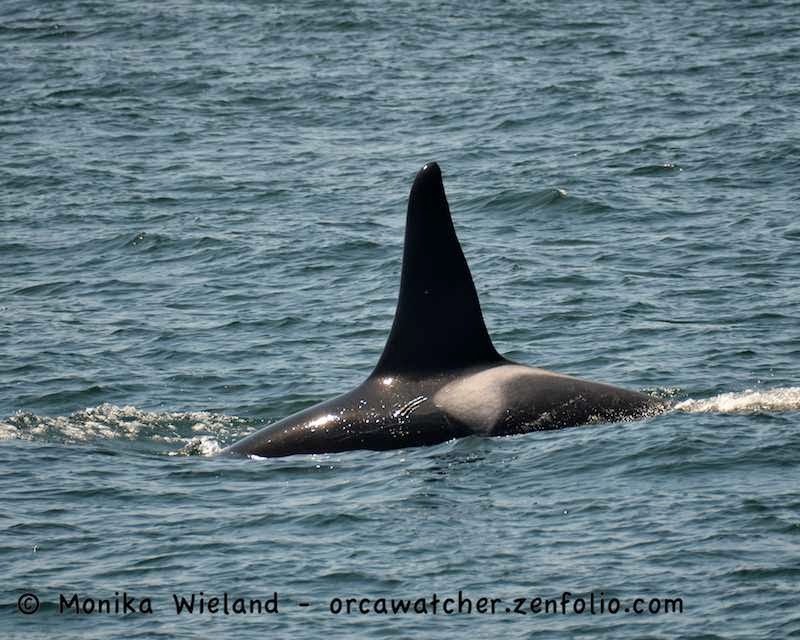 J27 was trailing some kelp off his dorsal fin for my first look at him in 2014! 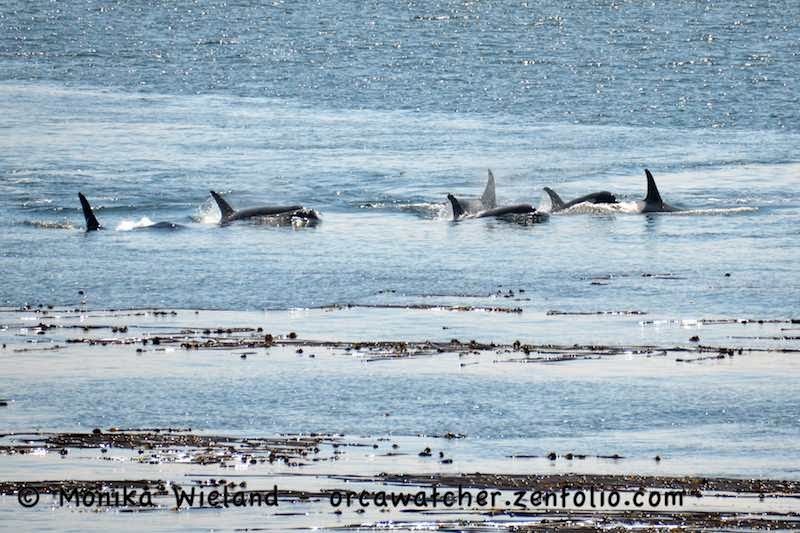 It's always so neat to see the whales in a tight group surfacing in sychrony! 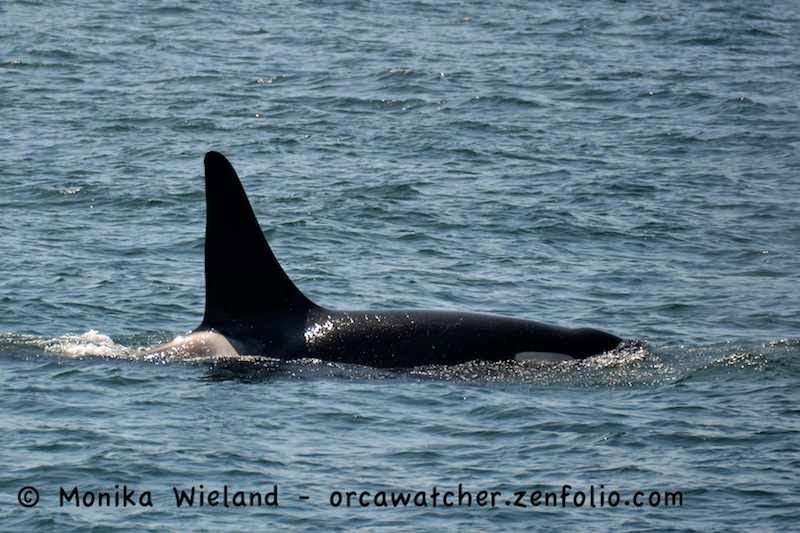 As the next group of whales approached, it became apparent that not only was the rest of J-Pod (the J11s and J17s) present, but the L12s were as well! 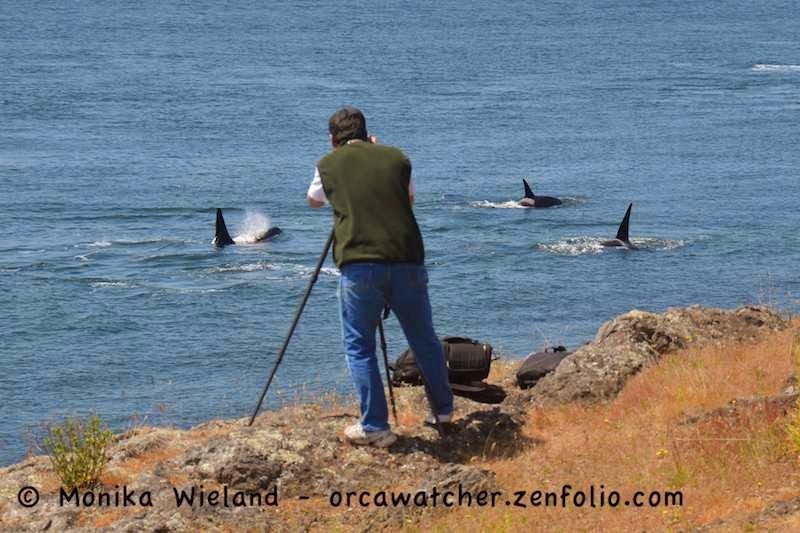 As the whales headed along the shoreline, I got a great photo op of another photographer. 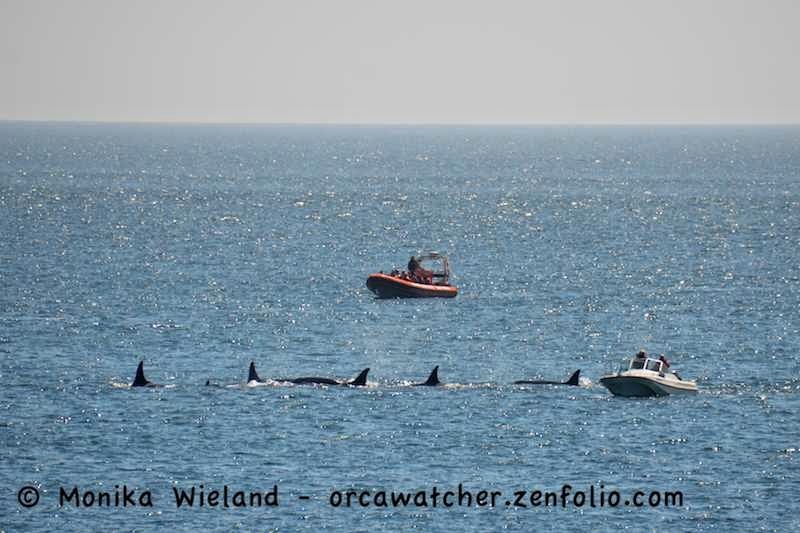 These shots really give the feeling of what it's like to watch these whales from the west side - if you haven't been out here before you may not have a sense of how close to shore they really come! 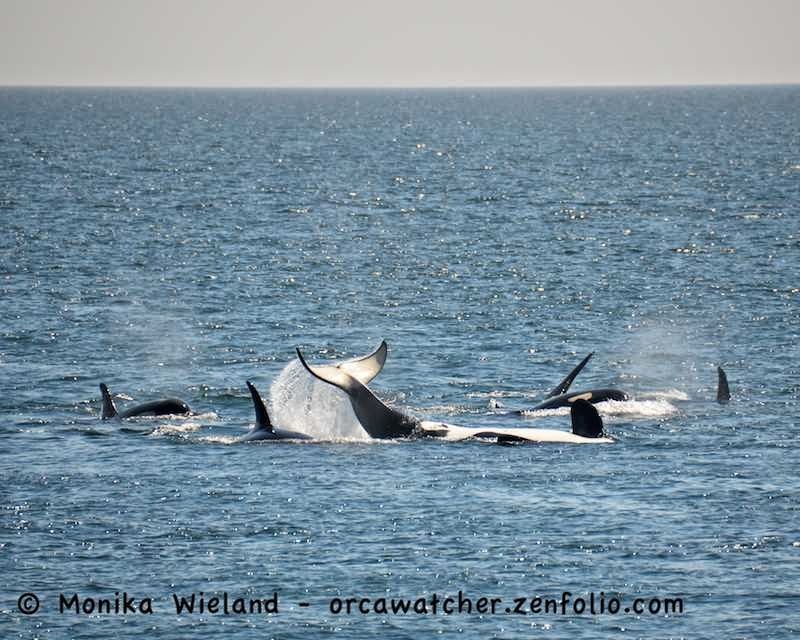 It almost seemed like the whales were a resting line, they were surfacing so slowly, but there were a few of them that were clearly anything but asleep! Since the whales were traveling so slowly, I knew my whale chase was far from over. It was time to run up the hill and race to Lime Kiln for the second time in a span of a couple hours! When getting to the park, I ran down to the lighthouse, arriving completely out of breath. 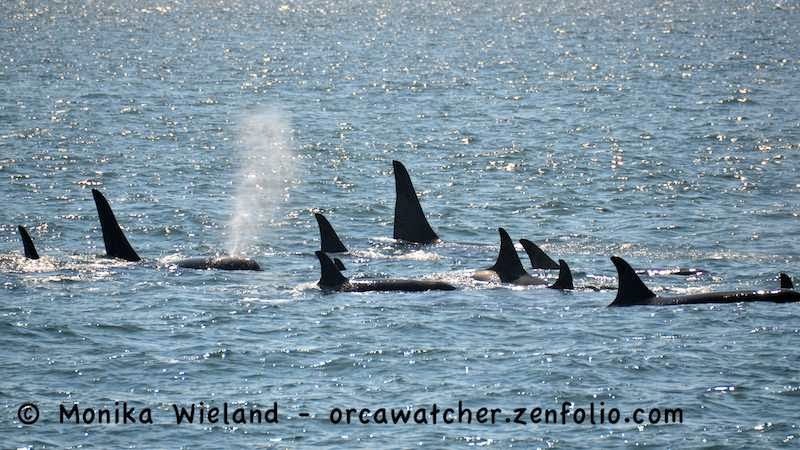 A few other whale watch friends turned around to greet me, clearly wondering what all the fuss was about. 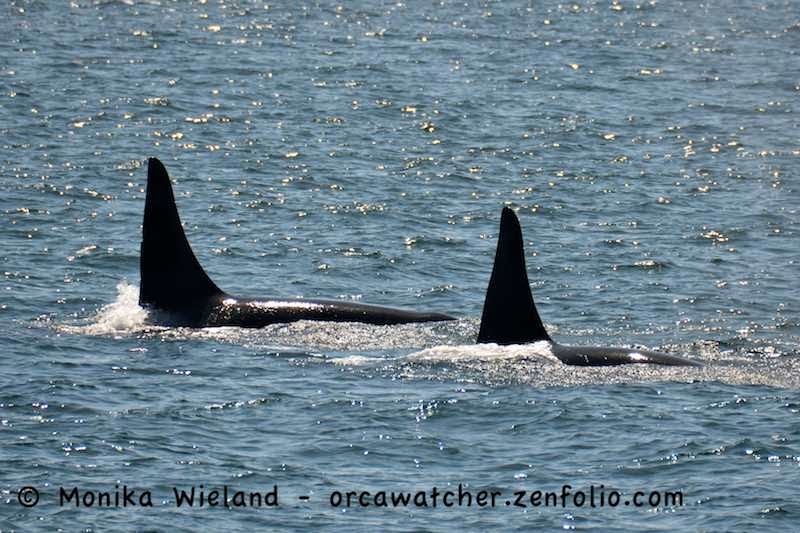 They could see some whale watch boats offshore, but could not yet see any whales. 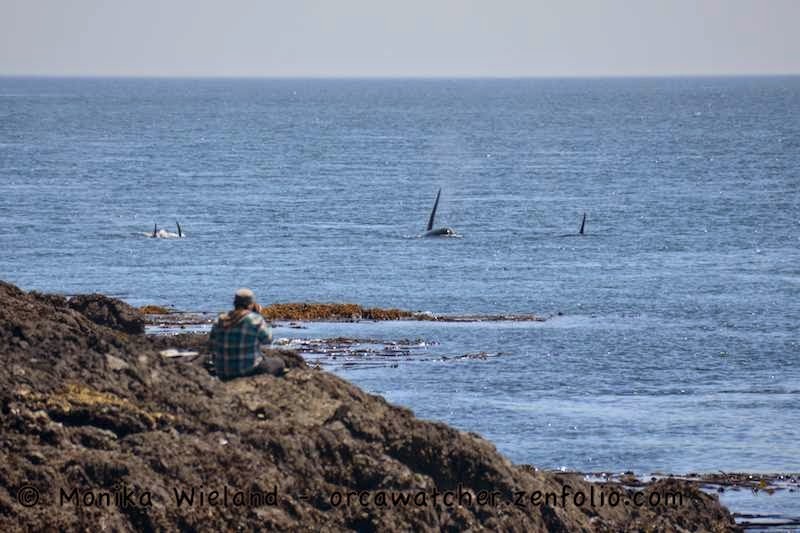 I told them the reason they couldn't see the whales is because they were so close to shore you weren't going to spot them until they came around the corner, right on the rocks! 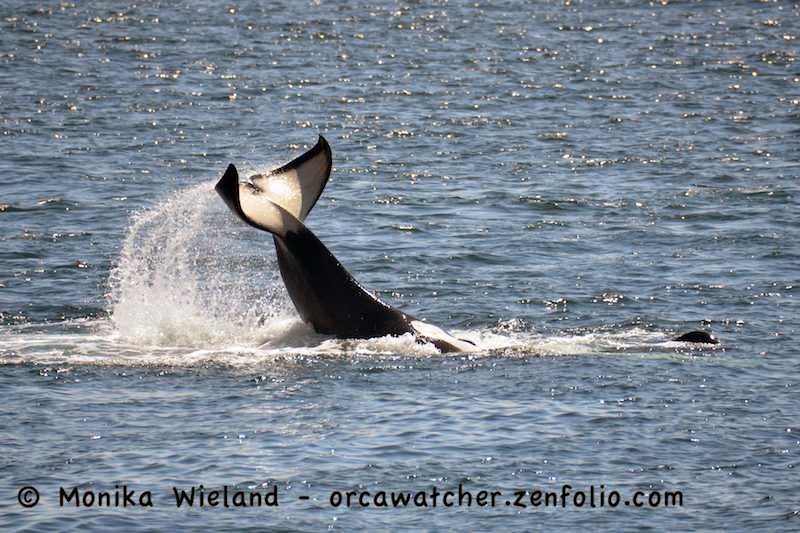 I love, love, love seeing so many dorsal fins at once! 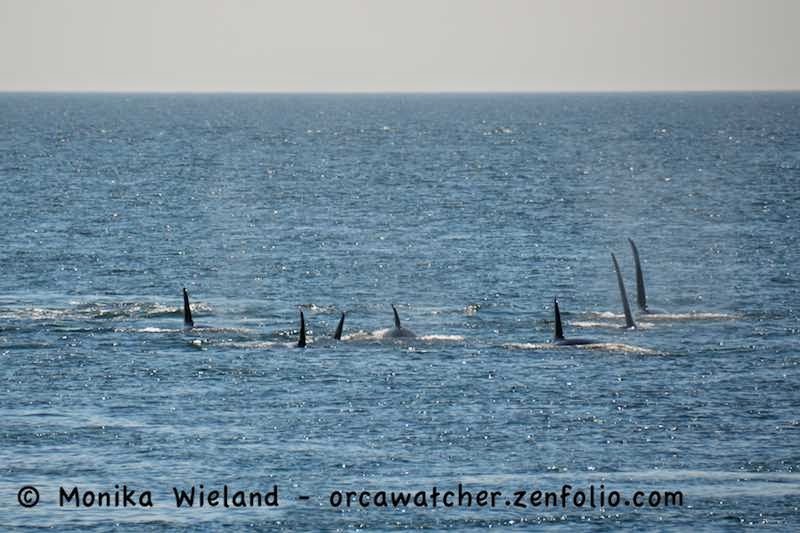 11 whales in one photo! L89 Solstice - from the other side this time! 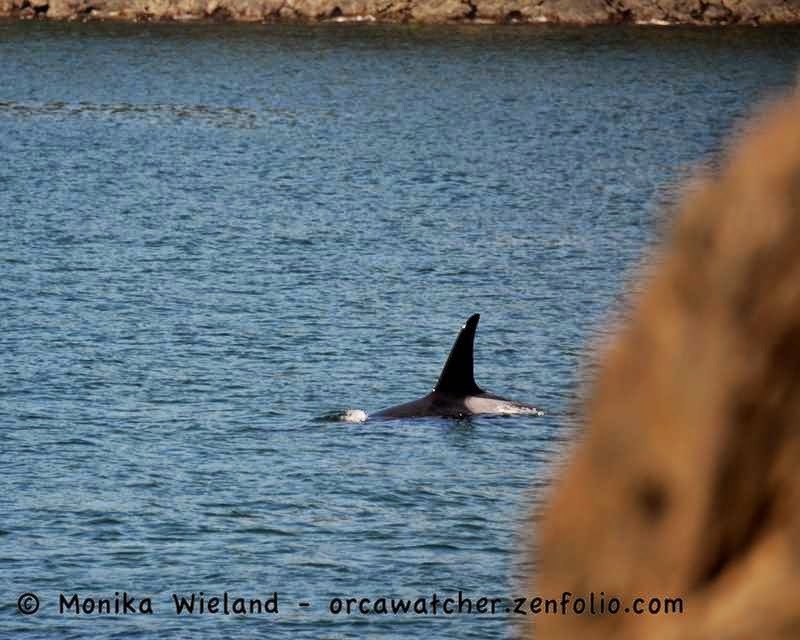 It was a quiet, but beautiful, ending to a stunning whale encounter. Nothin' but water and whales. 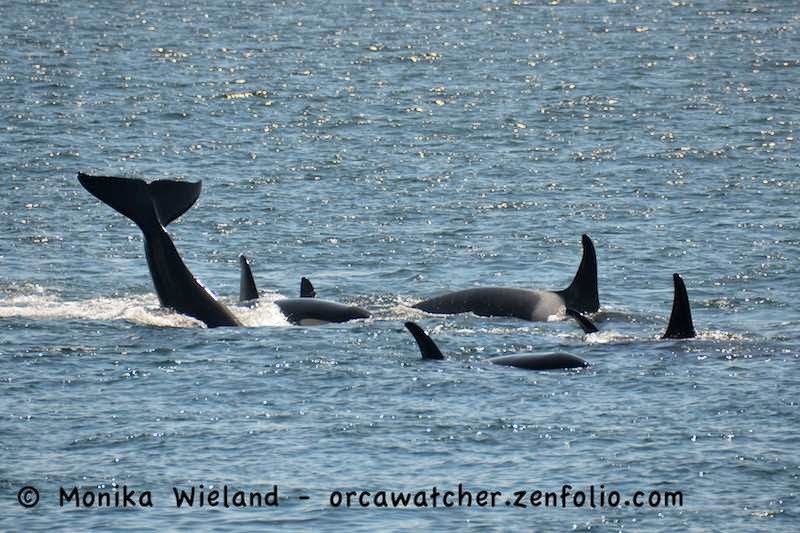 Lots of whales. The visit turned out to be a brief one. 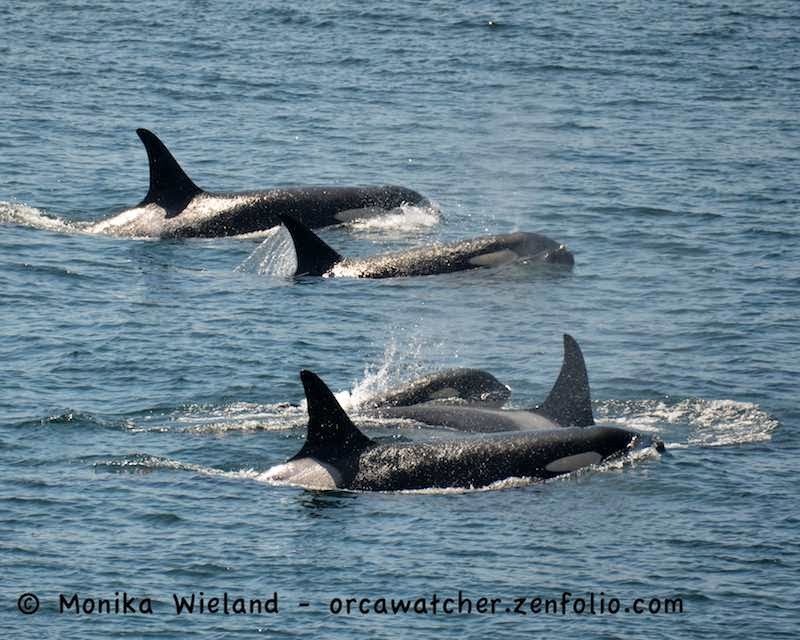 The next day, the 4th of June, the L12s, J11s, and J17s were seen heading back west out the straight. 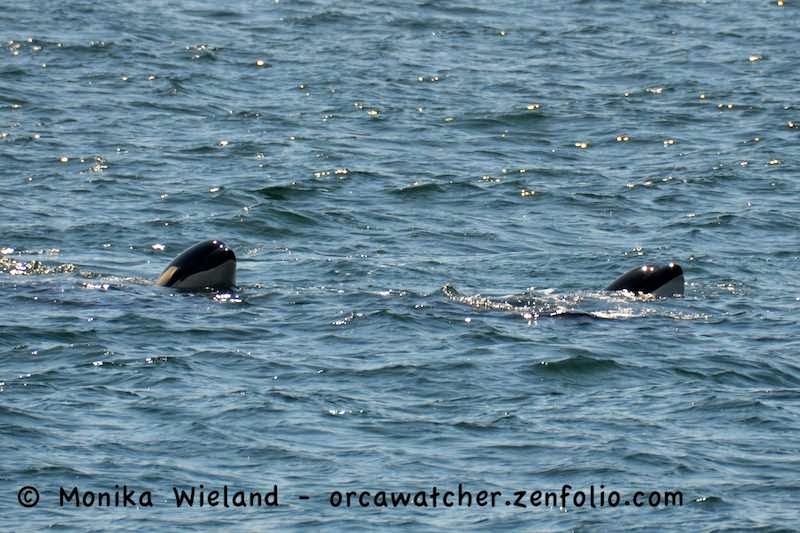 How fascinating this new pod splitting and mixing is - 10 years ago it would be unheard of for J-Pod to separate this way! 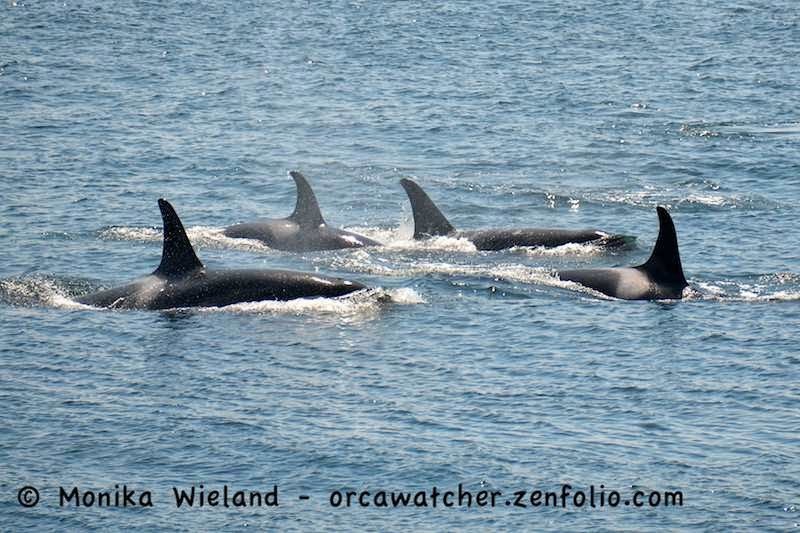 Thankfully, the rest of J-Pod would stick around, though! Impressive set of pics there Monika, hope they stay around all summer for you. I've been subscribed to your blog for some time now. Thank you so much for your fabulous writing and photos. You're the only blog I never miss a post on since I can't be there in person. 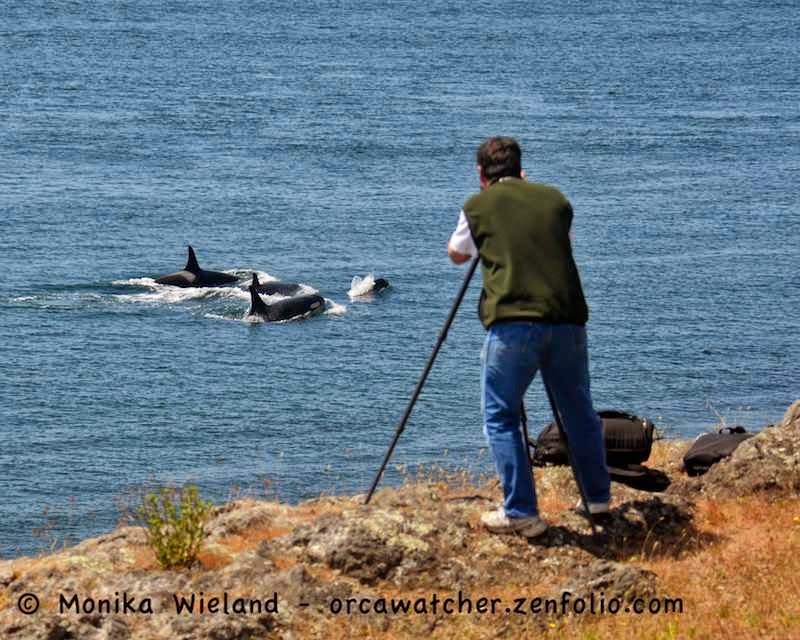 I'm coming up to Friday Harbor for the first time in July, and (not that I'm not an easy sell) the photo of the photographer on land with the whales so close in the background is one of the best travel-inducing photos I've seen for Lime Kiln Point. I'm kiddy to try my shot at taking some photos of my own. 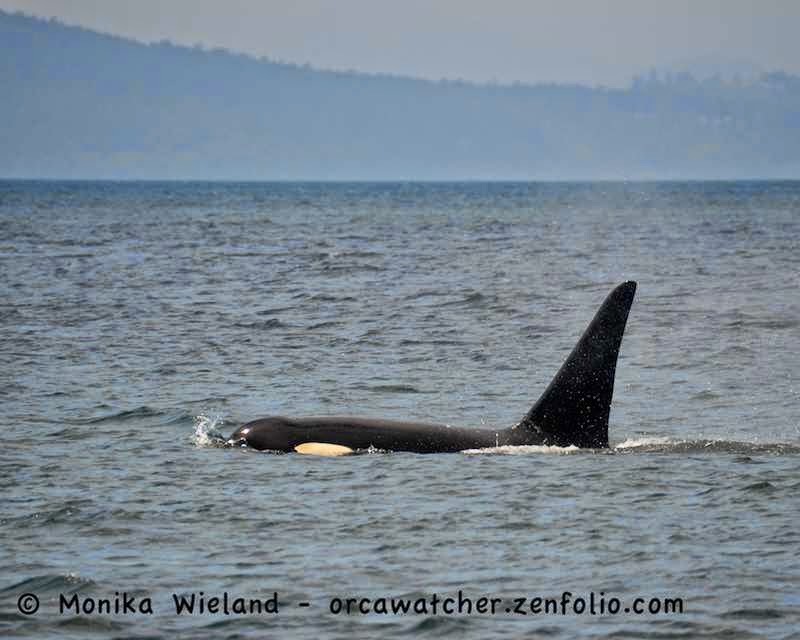 Hopefully the whales will be there, and maybe I can meet you as well.